Carries 4 people (900 lbs) in comfort on bench seats and can take a motor. Yet is weighs only 125 pounds. It's a classic design with a long history and many satisfied owners. The Sunchaser I (this model) carries 72 square feet of sail area in a single sail. The Sunchaser II has the same hull but carries 100 square feet of sail in 2 sails. Click on Sunchaser II link to see videos of what it's like to be aboard! This video (click colored word) was done by a customer and it's great. It's a 2015 video of a very old Sunchaser, so it demonstrates both performance and longevity of the boat. Here is another video link on the Sunchaser I. More info, Price, or To Buy: Click Here Price is $4006 plus shipping. Bonus offer - 2 lifejackets, or a long skinny bag that protects the sail, mast and spars for car topping and storage (your choice) just for putting the word "Bonus" in the comment space when you check out. The Sunchaser I has a 72-square-foot lateen sail. The advantage of the lateen sail is it is very easy to use. Very easy to rig and very easy to raise and lower the sail. And with just one sail to handle, it's very easy to sail. Those who want more speed and the fun of handling 2 sails, and who are willing to accept the extra steps involved in setting up a sloop rig, should consider the Sunchaser II instead. As you can see in this photo, there is comfortable seating space for 4 adults. View from above with sail removed. The two black triangles on the bow (top of photo) are hatches that open and close. You can store gear and food in there. The hull is a plastic foam core covered with an ABS plastic shell. You can transport a Sunchaser on the roof of a vehicle, or on a trailer. It is only 125 pounds. All Snark Sailboats are intended for dry sailing, meaning you should store them out of the water when not sailing. The footwell area is 49" x 27". Note: Snark has eliminated the dagger board plug in current design, though it is still listed in intstructions. Main Sail Area 72 sq. ft.
Only differences in specifications for the Sunchaser II are (a) Main Sail area = 80 sq. ft. and it has a 20 sq. ft. jib. Rated for up to 5 HP outboard. Electric trolling motor recommended. Take a look at the sloop-rig Sunchaser II model and see videos. Click: Sunchaser II . Terms: Not returnable. Defects covered by manufacturer's warranty. Delivery dates are estimates only. Inspect before accepting delivery and refuse a damaged boat. Sunflower, Sea Skimmer , Super Snark, Sunchaser II. Roof Racks Click Here See carrier bar with telescoping extension to make it much easier getting your Snark on and off the car roof without damage to you, it or your car. 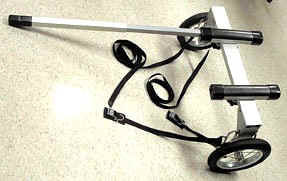 Trailer for Canoe, Kayak or Small Boat - FREE Shipping!